John Ambaddi is responsible for the return of Nuba child soldiers to a normal civilian life. My name is John Ambaddi. I come form Anupta in the Moro area. I was born in 1958. I joined the Komolo in 1986, because our area was so neglected. There was no development; there were no hospitals, no schools, no good roads. We were not involved in decision taking. You can see it with your own eyes: these are the facts: the Nuba Mountains remained closed to the world since independence and there was no development. Personally I blame the British: they neglected the Nuba Mountains to begin with. My story is long, but right now I will talk about my present work: I'm an officer with the Disarmament, Demobilization and Reintegration (DDR) Program in the Nuba Mountains. 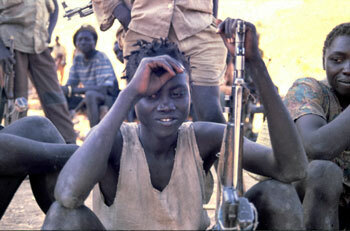 We try to identify child soldiers, to disarm them and to help them to return to civilian life. There are many reasons why the children joined the army. It was not the policy of the Movement to recruit them into the armed forces, but the situation itself forced the women and then the children to join the SPLA. They sought to protect and defend themselves. We have started working in January. So far we have registered about thirty child soldiers in Brigade 26 here in Lueri; and then in Brigade 27 we have registered one hundred and fifty. We still work to register the remaining children. The child soldiers are as young as thirteen years, up to seventeen. From eighteen years onwards, they are regular soldiers. The DDR Program was an agreement between the Government of Sudan and the SPLA, that al the children who were with the armed forces should be brought back to civilian life. The children are supposed to be reunited with their families. They should go to school and lead a normal life. Of course the life of a military man is different from the life of a civilian. We try to help them to make that change. For instance, when we release them, we have meetings with the chiefs and the community leaders. We tell them that they must convince the children to stay home rather than to think about returning to the military life again. They must encourage them to resume a civilian life. The children will go to school in the community; we are not going to separate them from the other children. I have also requested for a vocational training program that could help children who do not like to go back to school. They could learn carpentry, tailoring, building etc. There is a similar program in South Sudan, in Yei, but I'm sorry to say that up to now it isn't available in the Nuba Mountains. We have been given a year to return all the child soldiers in the Nuba Mountains to their families by the end of the year. I'm sure we will complete the mission within that time.